Small traces of oxygen can deactivate the molecular catalysts that are incorporated in fuel cells. A team of researchers from the Ruhr-Universität Bochum (RUB), the Max-Planck-Institute for Energy Conversion in Mülheim and the Pacific Northwest National Laboratories in Washington, U.S.A., is able to equip such a catalyst with a self-defense mechanism against molecular oxygen. The self defended from oxygen fuel cell in the RUB Laboratory. Image Credit: RUB Marquard. Click image for the largest view. Hydrogen is thought to be one of the most promising fuel sources in the future. Typically, catalysts based on noble and scarce materials like platinum are used in highly efficient H2/O2 driven fuel cells. A promising alternative for this expensive and limiting catalyst material are molecular catalysts based on abundant metals like nickel and/or iron, which resemble a mimic of the active center of nature’s highly active hydrogenases. The team’s research results have been published in Nature Communications. An interesting class of such molecular catalysts are the DuBois type complexes. Their active center comprises a central nickel-atom that is coordinated by pendant bases. These catalysts reveal a high activity which is similar to those of the hydrogenases and their ligand structure can be altered to enable catalysis in aqueous systems and allow for the covalent attachment to electrode surfaces. A serious drawback of such catalysts are their high oxygen sensitivity, which hampers the use of these materials in technological applications in current fuel cell systems. However, in analogy to the hydrogenases, that can be protected by incorporation for the biocatalyst into an oxygen reducing polymer matrix, the researchers are now able to transpose this protection system also to a DuBois-catalyst. For the protection against oxygen, the researchers introduced a hydrophobic and redox-inactive polymer as an immobilization matrix for the nickel-complex based catalyst. The embedment of the catalyst into the polymer matrix ensures the formation of two separated reaction layers: a catalytically active layer close to the electrode surface and a protection layer at the polymer/electrolyte interface. The first layer allows for an efficient conversion of hydrogen at the electrode surface and the second layer removes incoming oxygen at the interface and thus protects the active layer from oxygen damage. According to Schuhmann, “The catalyst itself provides the protection against oxygen. For this, the catalyst uses electrons from the hydrogen oxidation in the outer polymer layer which are then used to reduce oxygen at the catalyst centers.” This becomes possible because the developed polymer matrix electrically disconnects the nickel-catalyst located in the outer polymer layer from the electrode surface. Hence, all electrons extracted from the hydrogen oxidation in the outer layer can be used for the reduction of harmful oxygen at the polymer/electrolyte interface. Concomitantly, the polymer prevents the transfer of electrons from the active hydrogen oxidation layer at the electrode surface to the protection layer. Thus, all electrons from the active layer are transferred to the electrode and are not used for protection. The polymer/catalyst modified electrodes showed an excellent long-term stability and remarkable current densities which are both prerequisites for powerful fuel cells. 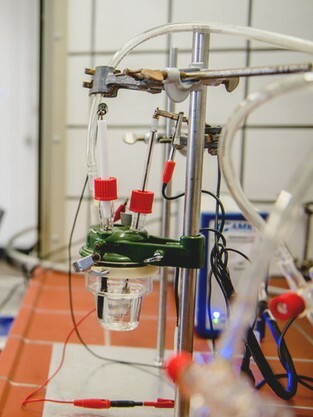 The proposed hydrogen oxidation electrodes are thus a promising alternative for the development of sustainable and cost-efficient energy conversion systems. Maybe this development will make it possible for non-precious metal catalysts to go to commercial scale. So far the hydrogen economy with water splitting, storage and fuel cell power make fossil fuel systems look superbly economical. But the storage problem remains . . .